(Reposted from http://the-knowledge.org/en-gb/knowledge-quick-reference/ which contains active links to resources mentioned. Post ideas, links to products or your own creations in reply to this topic. In the broad sense, The Knowledge is a compendium of information useful to post-cataclysmic persons and societies. The near-term object is to help survive and thrive in collapsed conditions, while the greater goal is renaissance. Concise summations of a wide range of disciplines and skills rendered in durable medium – able to resist rough handling or exposure to the elements – will increase the chances of success. Fortunately, much thought and effort has already gone into this kind of summary for students, professionals and hobbyists. Together, they comprise a goldmine of supplemental information to that presented in The Knowledge. Such fundamentals as the scientific method, physics, chemistry, biology, medicine and select mathematics. Technologies such as accounting, electronics, mechanics. Skills such as first aid, weather forecasting, sailing and navigation. Identification guides for wild edibles, birds and animals, and survival techniques. These are already available, though may take some looking. Together, they comprise a gold mine of information supplemental to that presented in The Knowledge. 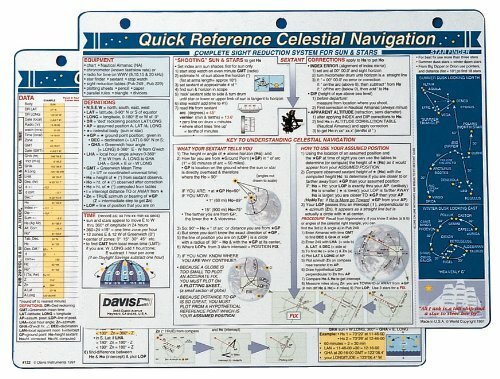 Typically, they are laminated, but some are available printed directly on durable plastic, which improves their chances of surviving calamity. As a next step forward, we might begin to collect and share what exists, rate it by level and modify as necessary for survivors. We might organize pages to fill current gaps, drawing on our own and expert experience. Each is an art in itself, and synopsis is another. Collaboration encouraged! Blacksmithing, tinsmithing, stone masonry, carpentry… the list of possibles goes on. The three ring binder format is not only widely established but it allows tailoring to one’s individual interests and needs. It is extensible as new information becomes available. It can organize one’s own notes and sheets. It can be short-listed in time of flight. The binders themselves are available in a number of rugged designs. I personally see this as a 'rough-draft' approach, allowing useful, reasonably durable, step-wise implementation. Once core presentations stabilize as important, well presented and edited, more expensive, durable formats might be arranged. My thought is that a solid start for a library of concise guides in 3RBF (3 Ring Binder Format) would be to translate The Knowledge on a chapter basis. Where it seems advisable, each chapter may itself be presented as a set of guides covering related themes within the chapter. For example, the chapter on Substances might include sub-guides, one covering the suite of calcium carbonate (e.g., limestone) variations with chemistry, processes and applications, another covering the suite of pyroligneous (wood derivitive) products in the same terms, and so on. This approach would work within the template provided by The Knowledge, drawing on information and references presented therein as well as other sources where appropriate. Dr. Dartnell has graciously given his go-ahead for this project.